Justin Smoak: The All Star? Now I’ve taken some heat for my old Justin Smoak bashing ways. I’m not going to sugar-coat it. I was wrong. But as a Jays fan first, and a former Justin Smoak hater second, I’m glad I was wrong. So far this season, Justin Smoak has gone and hit his way into the All Star conversation. His emergence as a lethal bat has been especially important for a Jays team that has been riddled with injuries and overall terrible play, yet somehow find themselves 3 games back of a wild card spot. Before I dive right into Smoakie’s success, I’m going to try and justify my Smoak-hating ways. I am the furthest thing from a baseball expert. My house league skill-level and limited coaching has not given me an eye for fundamentals that someone who has played the game at a high level posses. But up until this season, what you saw was what you got from Justin Smoak. My eyes saw a lumbering first baseman that swung for the moon on every pitch yet routinely couldn’t locate the ball with a GPS. Up until I watched him live at home on April 19 vs. the Red Sox (a game in which he didn’t get a hit, but hit some pretty hard line drives for outs), I thought he was the worst 2 strike hitter I’d ever seen. My theory was that Smoak had been burned by so many curveballs in his career that he was constantly geared geared for the curve on 2 strikes. This put him miles behind any fastball he swung at and he still couldn’t hit the curve when he was shown one. One of the reasons that my Smoak opinions seemed vindicated was that the eye test was so clearly backed up by unflattering advanced metrics. At this time last year he was lauded as a defence-first first baseman and, to his credit, he seemingly looked the part. But for whatever reason, the underlying stats (UZR, Defensive Runs Saved), still didn’t look kindly on old Smoakie, suggesting that he wasn’t as sure handed and didn’t cover as much ground as a quick eye test would suggest. Going into his seventh big league season, Smoak was such a far cry from the Teixeira-eqsue prospect that made him the main return in a trade for Cy Young winning Cliff Lee (2010 between the Rangers and Mariners) that people were starting to even give up on him as a “project player”. It was mere months ago that the Blue Jays front office took heat for even locking Smoak into a Opening Day roster spot at all. Then Justin Smoak decided to prove us all wrong. Justin Smoak already set career highs in both @fangraphs and @baseball_ref WAR … and then hit two homers today. This is not the Justin Smoak I’ve become accustomed to seeing. The underlying advanced peripheral stats show that this hot streak doesn’t seem to be a fluke either. His Batting Average on Balls In Play (BABIP) is actually down from last season (.281 versus .295) meaning he’s getting less batted ball luck this year than his horrendous 2016. Also his hard hit contact percentage is up a tick from last year at 40.9%. He’s always had power and a beautiful swing, but this season Smoak has been more patient at the plate which has resulted in a strong strikeout % of only 17.9 (down considerably from last season’s 32.8%). His swing is also noticeably less pull-happy as his Pull% is down 1.7% from last year with his contact to centre field jumping up a whopping 9.4%. These adjustments have made him less predictable at the plate and should help him to avoid some of the extreme infield shifts that he’s been seeing when he bats left-handed. Now some people attribute Smoak’s emergence to getting regular at-bats and being able to work out the kinks and grind through the rough patches. That could very well be, but the Jays were well within their rights to bench him when they did over the past two seasons. They were a team with championship aspirations, Smoak looked lost, and other players–Colabello in 2015 and the Michael Saunders/Bautista/Carerra/Upton outfield DH rotation last season–deservingly stole his at bats. April and early May of this season were really the first instance in quite sometime that the Jays were bad enough to let Smoak ride out a tough Spring Training and predictably slow first couple of weeks to the season. I’m not ready to put all of my faith in the “Smoak is just a natural hitter who needed more regular reps” theory, but it certainly does hold some water. If this really is the end for “bad” Justin Smoak, that really is a loss in some ways for Jays fans. 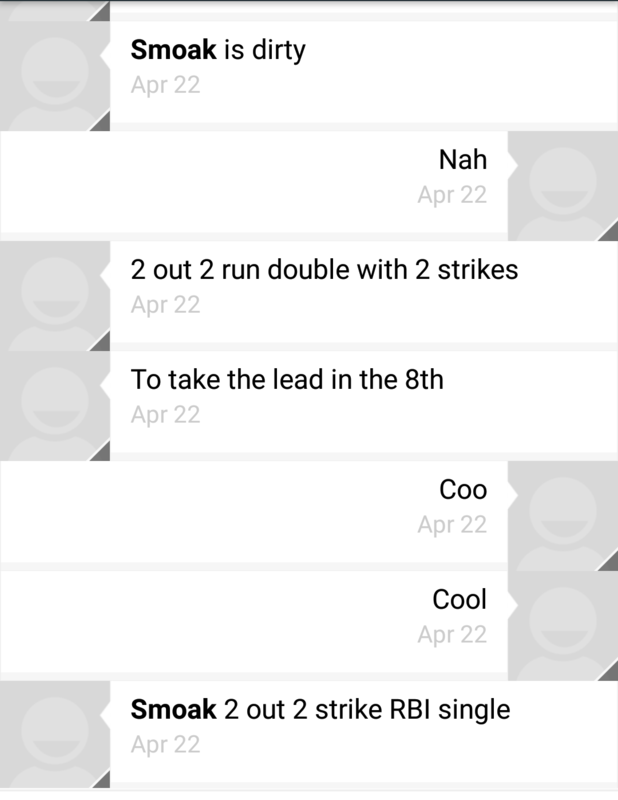 The Justin Smoak strikeout followed by a “why does this guy even hold a bat?” text from my uncle brought me way more joy than it should have. As a Toronto-sports fan, success is fleeting at the best of times. The Blue Jays’ championship aspirations may have already reached their expiration date. But true lowercase goats like “bad” Justin Smoak, Melvin Upton Jr., Dave Bush, Kelly Johnson, Jojo Reyes and Miguel Batista (worst closer ever in my biased opinion) are immortally incompetent and have built up the character of the real Jays fans. If you could watch these guys collect paychecks for some truly uninspiring baseball and not completely quit on the sport altogether, then you know that you earned your fan status. Things are looking great for the Smoak Train. Last night he hit two crucial home runs in a 10 inning win over the Oakland A’s, and he’s picking up some major steam in the All Star chatter. If this version of Smoak is here to stay, chalk it up as another Anthopoulos prospected diamond-in-the-rough corner infielder with a chance to be a cornerstone in the same light of a Bautista or an Encarnacion. But it is still relatively early in the season and for all we know he could be a flash in the pan like a Chris Colabello or Juan Fransisco. For the sake of the Blue Jays and their fans, here’s hoping it’s the former rather than the latter.